The Flyer is fine, but certainly not as good as it thinks it is. 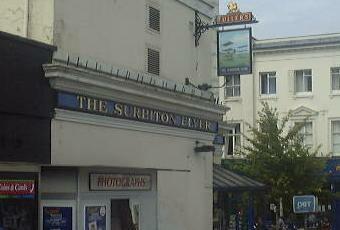 As others have said, it's expensive, but that seems to be the standard for Surbiton now. Certainly not a bad place, but hardly groundbreaking either. Fullers pub, cost £4.20 for a pint of Red Fox, served in a jug. Quality fine. Gastro pub so a bit bland. TV showing Sky News when I visited mid afternoon. Excellent pint of Fullers Red Fox, but, £4.25 is ludicrously expensive for a pub on outer fringes of Greater London. Surprisingly attractive inside; better than you'd expect. (A former bank premises.) Very handy for station (right next door) and meals looked good though not tried. I thought that the Fuller's pubs in Harrow were expensive, but this pub is even more so. Handy for the station, and I was wasting 30 minutes before catching a train, so had no time to find a pub that served reasonably priced beer. So this pub had to do.